Aiming for the Top, with our Customers. We put all our energy and techniques into this AQT series. AQT has patented structure which is basic structure like clamp unit and change holder make it possible core height adjustment. Furthermore, this series achieves high performance in every way including quick change and core height adjustment with only one wrench. We offer special type as well, please feel free to contact us for ordering. Temporary fastening method (PAT) realizes easy and comfortable core height adjustment. Size of tool holders and chips are not always fixed. AQT system has core height adjustment structure which help fasten with subtle strength. 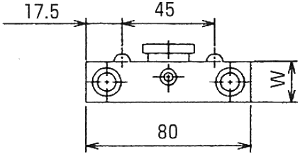 We had to depend on experience and intuition to adjust core height with former dovetail groove type QC tooling, because it was inevitable to prevent descent of core height. However, AQT system adopted temporary fastening method (PAT) and solved this issue, made it so easy that anyone can adjust core height accurately. Easy core height adjustment and energy-saving. 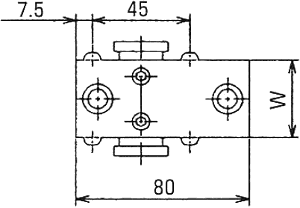 Clamp structure of AQT system has adjustment position between clamp and unclamp, in order to make core height adjustment easy. 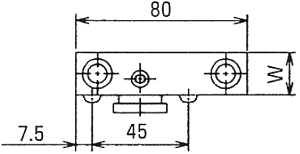 You can precisely adjust core height with accuracy of 100%, soon after noticing shift of a blade or remaining center boss on an end face of a finishing work. 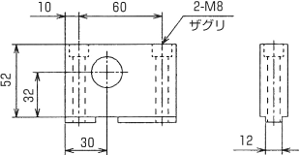 Base plate is used to adjust core height and mounting position of the equipped machine. You can use this as a common tool holder on any machine if you have base plates for each machine. This is a necessary attachment to mount AQT system on NC lathes. 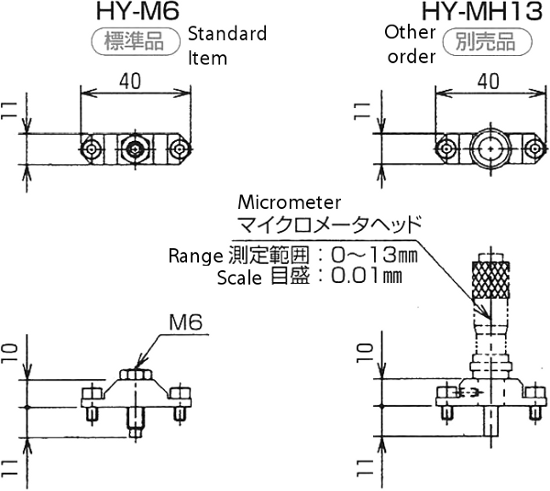 This product is made to order, please specify measurements of H/ K/ P/ L/ W/ A/ B/ M on the figure below. 1, you can true up edges of the blades since you can designate hole to attach a clamp holder. 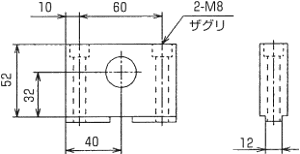 2, YB2 is suitable to hold several tooling with narrow space between them. 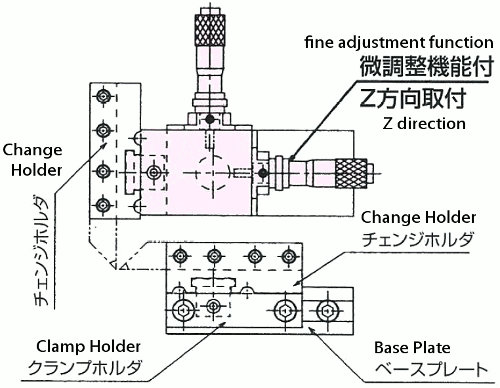 3, we offer special clamp holder which is combination form of base plate and clamp holder. Please order this in case core height is too low or holder balance is not stable. Patented structure realizes easy and quick adjustment of core height with only one wrench. 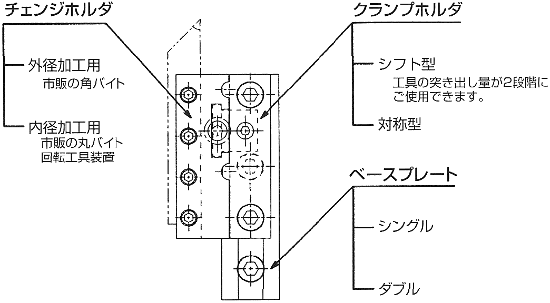 This is the main unit of AQT system. You can choose where to put it (right side/ left side/ both sides) and the number of attachment (single/ double). Projection amount of tooling is used in 2 stages since shift type can be reversed. 1,We offer special holders adapting your request, feel free to order. This can be used on both right and left sides. Screws for core height adjustment are supplied. Attach tooling to this holder and this change holder is used in combination with a clamp holder. There are 2 types: the one for square tool and the one for boring. Right and left sides by reversing core height adjustment unit. 2, Projection amount of tooling is used in 2 stages by inverting. Usage example of AQT system. 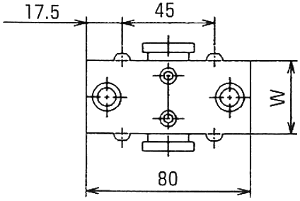 Simultaneous machining: both end faces. 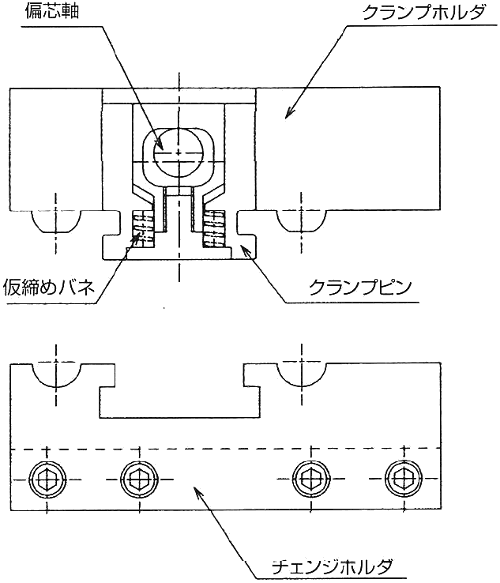 1, You have to finely adjust the clamp holder to either Z or X direction at least at one position when you operate simultaneous machining. 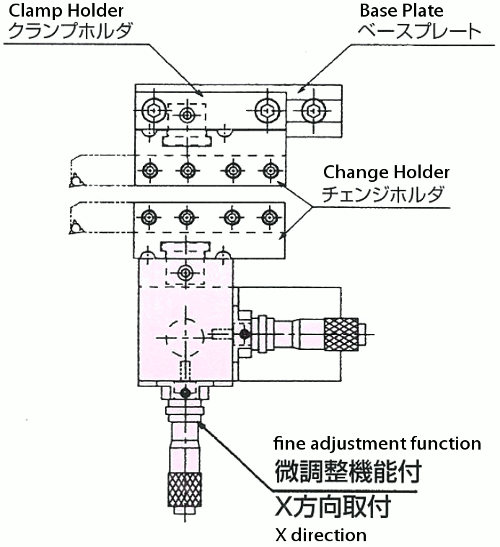 2, We offer special clamp holder with fine adjustment function as well, please feel free to order.